Session stores are crucial for holding user data as traffic to any given server increases, but they are not always able to meet the industry’s rigorous data processing standards on their own. If the traffic to a server continues to increase and the server itself begins to struggle, for instance, a company might add more servers, with a load balancer to ensure that each server equally manages incoming traffic. But in this case, what happens if a user is directed to one server the first time they log in, and to a different server the next time? Their session data would still be stored on the first server, and the second server would not recognize them. This is where microservices and Redis come in. In addition to presenting an alternative to a monolithic application framework, microservices can make session stores more intelligent, and enable them to perform more advanced processing. When we talk about “intelligent” data, we are referring to data beyond a user’s username or preferences — such as group notifications or activity data. Please download the ebook to learn more. If using microservices, a company might maintain a load balancer between its Internet traffic and its server, but its server would be linked to both a database and a session store microservice. By decoupling session storage from the server, the company would be able to handle advanced processing commands, complex use cases and increased traffic without compromising on speed or performance — and its servers would recognize the user from the previous example regardless of the server to which they are directed. Microservice architecture also allows different teams of developers to work independently, in different languages and at their own paces. Redis is a terrific option for companies looking to use microservices to render their session stores more intelligent. In this particular framework, Redis serves as both a database and a transport mechanism; it enables a microservice to store session data independent of the server, but it also allows the microservice and the now-stateless web server to communicate with each other. And by using Redis, companies can add on as many servers as they want, because they are completely stateless and isolated from the microservice. Compared to other popular databases, Redis is highly available and offers high volumes of writes and reads at very low latencies, and the Redis API can support a variety of use cases and data structures. Redis also comes with its own data structures and modules, including Bloom Filters, HyperLogLog and Bit Counting. Additionally, Redis’ session store microservice enables the storage of more advanced data by implementing content surfacing, activity pattern monitoring and personalization, group notifications and more. Microservices are certainly not required for all session stores, but if your company wants to tailor its hardware and infrastructure to more complex use cases, accommodate increasing traffic to its servers or implement data storage for more than the most basic user data, Redis is the ideal solution. 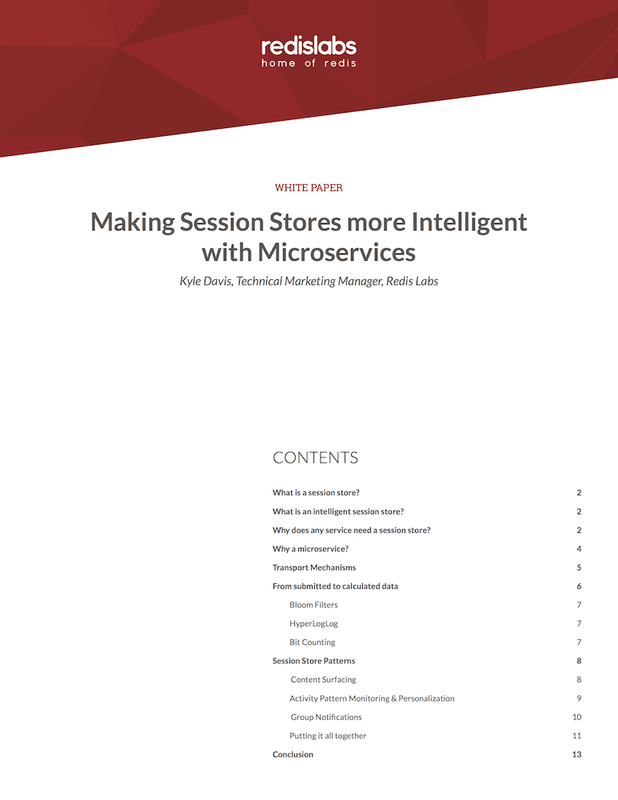 To find out more about how microservices can improve a session store, and how Redis can help you seamlessly switch to microservices, please download our ebook.